Be conscientious in Peng (Ward-off), Lu (Rollback), Chi (Press), and An (Push). Tai Chi Push Hands is an excercise that includes two people who practice Tai Chi skills and philosophy together to gain a better understanding of the principles of Tai Chi and to train several key aspects of Tai Chi including sticking, yielding, sensing, neutralizing, warding off, and others. It is a key aspect of becoming a skilled Tai Chi practioner and should be practiced with as many different people as possible as often as possible. 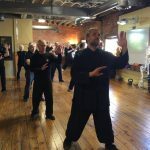 Many Chinese Texts offer insight and explanation for using Tai Chi Chuan as a tool for Self Defense, including “Tao Te Ching” and “Tai Chi Classics” as well as others. Under Heaven nothing is more soft and yielding then water. Yet noone puts it into practice. move like a great river. Tai Chi Chuan (Taijiquan) can be translated as Supreme Ultimate Boxing. Thought by many to be the highest form of boxing, relying on intelligence and softness rather than brute strength. As it is said in the Tai Chi Classics. “There are many boxing arts. Although they use different forms, for the most part they don’t go beyond the strong dominating the weak,and the slow resigning to the swift. Some of the Tai Chi Martial training taught at The Tai Chi Boxing Association of Colorado Springs is Basic Applications from the techniques of the form, Tai Chi Fast Training, Jing (power) Training, Advanced Martial Qi Gong Training, Advanced Push hands and 2 Person Drill Training, Free Style Push Hands and Sparring, as well as other methods designed to lead you the way to becoming a proficient martial artist in the style of Tai Chi Boxing. Although to achieve many of Tai Chi’s great benefits it is not necessary to learn the martial aspects, a little known fact is the masters of Tai Chi who gained longevity and excellent health were all skilled masters of this wonderful martial art. 1) Fist – punching, striking, pushing, etc. 2) Leg – kicking, sweeping, tripping, etc. 3) Wrestling – uprooting, throwing, toppling, etc. 4) Qinna (Seize and Control) – grabbing, joint locking, cavity striking,etc. etc. All movements, however, are done effortlessly, merely going with the way of the attack rather then fighting against it. and the shen should not be unfocussed.